[Markus] was looking to upgrade his soldering station, and having had good luck with Ersa in the past, opted to purchase one of their new stations, the RDS 80. Once he got the iron home however, he was very disappointed to see that while his previous Ersa model used a silicone cable to connect the iron to the base station, his new iron used a stiff, non heat-resistant PVC cable instead. He found plenty of people complaining about the same issue online, but no one seemed to have a fix, so he set off to figure it out for himself. He thought that he could disassemble the iron and change the wiring out once it was apart, but it seemed that there was no way of doing so without destroying it. 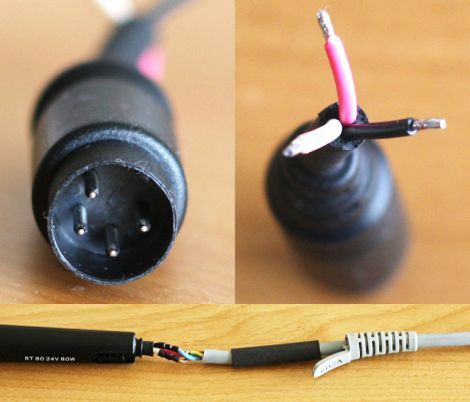 Instead he chopped the wire off at the end of the soldering iron, replacing it with a new silicone cable. He did the same thing at the base station end, since he was forced to reuse the proprietary 4-pin plug Ersa decided to use there. His modifications worked out nicely, and he is now happily soldering away. If you happen to have one of these soldering stations, be sure to swing by his site to get a closer look at how he swapped out the cable. Nicely done. It’s a risky modification (having to cut the wires off so close to the end of the iron), but the result looks perfect. It may interest readers here to know that the Aoyue stations from Sparkfun use silicone insulated cables. It’s super flexy, anyway. Now I’ll just twist these wires together and get my soldering iro… what?… hey… wait a minute! Haha, exactly what I thought, but you beat me to it. Good solution for my 18 watter Antex iron too. The original power cord is so heavy and stiff and the awkwardness of it’s stiffness is made worse by the fact the Antex itself is so light. I’ve had it nearly a year and the kinks in the cord has yet to fully straighten out. Nice hack. I love tweaking things to be just right. I’m gently concerned about weak points in a cable that does move a lot, but that’s just me. The plug appears to be a standard 4-pin DIN connector. Nothing proprietary about it. I use them all the time in projects. I did something kinda similar with my phone charger, it was too short to lay on my night-stand, so I cut it, and extended it. Hmmm no heat shrink tubing ? I just buy used professional soldering stations on ebay. I also have one i purchased over 30 years ago still going strong after replacing the heating element. It really don’t pay to buy the cheap ones. read the actual article link and youll see not only did he solder and heatshrink every wire, he put another layer of heatshrink over the entire thing and even reinstalled the flex/strain relief. Does anyone know where to buy cable like that? He just got it from the old station. I can’t seem to find any good sources for simple 2-4 conductor non-shielded cable. Sure digikey/mouser has some, but its usually 100ft minimums. Can somebody tell me what is the resistance of RT80’s sensor, and also, is it NTC or PTC ?